Each dispersible tablet contains: Deferasirox. 100 mg, Excipients Q.S. Each dispersible tablet contains: Deferasirox. 125 mg, Excipients Q.S. Each dispersible tablet contains: Deferasirox. 250 mg, Excipients Q.S. Each dispersible tablet contains: Deferasirox. 400 mg, Excipients Q.S. Each dispersible tablet contains: Deferasirox. 500 mg, Excipients Q.S. 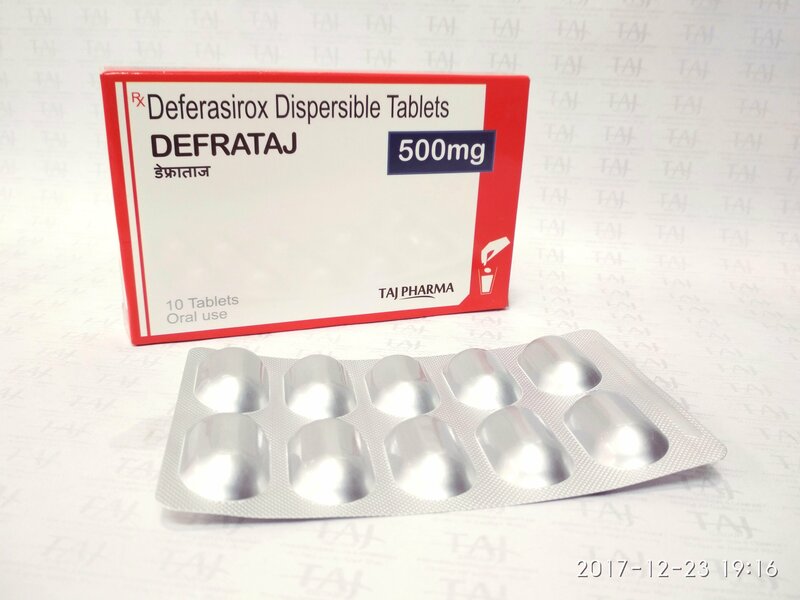 DefraTaj (deferasirox) binds to iron and removes it from the blood stream. DefraTajis used to treat iron overload caused by blood transfusions in adults and children at least 2 years old. DefraTaj is a tridentate ligand that binds iron with high affinity, forming a 2:1 complex that is excreted in bile and eliminated primarily via the feces. DefraTaj is indicated for the treatment of chronic iron overload due to frequent blood transfusions (≥7 ml/kg/month of packed red blood cells) in patients with beta thalassemia major aged 6 years and older. DefraTaj is also indicated for the treatment of chronic iron overload requiring chelation therapy when deferoxamine therapy is contraindicated or inadequate in patients with non−transfusion−dependent thalassemia syndromes aged 10 years and older. Data in children with NTDT are very limited. As a consequence, DefraTaj therapy should be closely monitored to detect side effects and to follow iron burden in the pediatric population. In addition, before treating heavily iron-overloaded children with NTDT with DefraTaj, the physician should be aware that the consequences of long-term exposure in such patients are currently not known. LIC is the preferred method of iron overload determination and should be used wherever available. Caution should be taken during chelation therapy to minimize the risk of overchelation in all patients. One course of treatment with DefraTaj is recommended for patients with NTDT who achieve a satisfactory iron level. DefraTaj (deferasirox) binds to iron and removes it from the blood stream. DefraTaj is used to treat iron overload caused by blood transfusions in adults and children at least 2 years old. DefraTaj is also used to treat chronic iron overload syndrome caused by a genetic blood disorder in adults and children who are at least 10 years old. You should not use DefraTajif you have severe kidney or liver disease, advanced cancer, a blood cell or bone marrow disorder, or low levels of platelets in your blood. Deferasirox can harm your liver or kidneys. Stop using DefraTaj and call your doctor at once if you have swelling, rapid weight gain, shortness of breath, pain in your upper stomach, loss of appetite, pain in your side or lower back, little or no urinating, dark urine, clay-colored stools, or jaundice (yellowing of the skin or eyes). Deferasirox may also cause stomach or intestinal bleeding. Call your doctor at once if you have symptoms of stomach bleeding such as bloody or tarry stools, or coughing up blood or vomit that looks like coffee grounds. While you are taking DefraTaj, do not take antacids that contain aluminum, such as Amphojel, Gaviscon, Maalox, Mi-Acid, Mylanta, Rulox, and others. advanced cancer; a bone marrow disorder; or low levels of platelets in your blood. kidney disease; liver disease; anemia (low red blood cells); cancer (especially blood cell cancer such as leukemia); a stomach ulcer; a history of stomach or intestinal bleeding; vision or hearing problems; or a weak immune system caused by disease (such as cancer, HIV, or AIDS), or by receiving steroids, chemotherapy, or radiation. It is not known whether DefraTaj will harm an unborn baby. Tell your doctor if you are pregnant or plan to become pregnant. DefraTaj can make birth control pills less effective. Ask your doctor about using non hormonal birth control (condom, diaphragm with spermicide) to prevent pregnancy. It is not known whether deferasirox passes into breast milk or if it could harm a nursing baby. You should not breast-feed while you are taking DefraTaj. How should I take DefraTaj? Take DefraTaj exactly as prescribed by your doctor. Follow all directions on your prescription label. Do not take this medicine in larger or smaller amounts or for longer than recommended. Your doctor may perform certain tests to make sure you do not have conditions that would prevent you from safely using DefraTaj. Take this medicine at the same time every day. Take DefraTaj on an empty stomach at least 30 minutes before eating. Do not chew or crush the DefraTaj dispersible tablet and do not swallow it whole. Place the tablet into a glass of apple juice, orange juice, or water and allow the tablet to disperse in the liquid. The tablet will not dissolve completely. Drink this mixture right away. To make sure you get the entire dose, add a little more liquid to the same glass, swirl gently and drink right away. If you take less than 1000 milligrams (1 gram) daily, dissolve the tablet in about one-half cup of apple juice, orange juice, or water. If you take more than 1000 milligrams daily, dissolve the tablet in about 1 cup of apple juice, orange juice, or water. While using DefraTaj, you may need frequent blood tests. Your kidney or liver function may also need to be checked every 6 months, and you may need a liver biopsy. Get emergency medical help if you have any of these signs of an allergic reaction to DefraTaj: hives; difficult breathing; swelling of your face, lips, tongue, or throat. kidney problems – urinating more or less than usual; painful or difficult urination; swelling in your feet or ankles; weakness, bone pain; feeling tired or short of breath; liver problems – nausea, upper stomach pain, itching, tired feeling, loss of appetite, dark urine, clay-colored stools, jaundice (yellowing of the skin or eyes); signs of stomach bleeding – bloody or tarry stools, coughing up blood or vomit that looks like coffee grounds; low blood cell counts – fever, chills, flu-like symptoms, swollen gums, mouth sores, skin sores, rapid heart rate, pale skin, easy bruising, unusual bleeding, feeling light-headed; or severe skin reaction – fever, sore throat, swelling in your face or tongue, burning in your eyes, skin pain followed by a red or purple skin rash that spreads (especially in the face or upper body) and causes blistering and peeling. Common DefraTaj side effects may include: nausea, vomiting, stomach pain; diarrhea; or skin rash. Comments: -Only consider therapy when evidence of chronic transfusional overload exists (e.g. transfusion of at least 100 mL/kg packed red blood cells and a serum ferritin consistently greater than 1000 mcg/L). -Prior to treatment, obtain serum ferritin level, baseline serum creatinine in duplicate and determine creatinine clearance, serum transaminases, bilirubin, and baseline auditory and ophthalmic examinations. -Tailor dose to patient response and therapeutic goals. Store Deferasirox tablets at 25°C (77°F); excursions are permitted to 15°C-30°C (59°F-86°F) [see USP Controlled Room Temperature]. Protect from moisture.